At the heart of the holiday season many individuals take the time to volunteer, make donations, and find other ways to give back to their communities. When it comes to community outreach like this, many private investigations firms will choose to participate. We recently spoke with George Sano Investigations, a company that has chosen to donate to local organizations year round. Why was it important for GSI to pay it forward this holiday season? GSI: Toni and George Sano do not take their hard work and success for granted therefore, they completely embrace participating and giving back to others less fortunate. George expresses how he values others with action – the giving of their time and monies to raise awareness for both well deserving organizations locally (Joanie’s Purse Project) and globally (3Strands: a world free of human trafficking) to empower others. GSI: It honors the legacy of Philanthropist Joan (Hoefs) Smith, who resided in Orange, California. It gives to women living in shelters a gift to remind them just how important they are to us. It provides purses filled with personal care items, snacks, and a clothing voucher to women twice a year - Mother’s Day and Christmas. 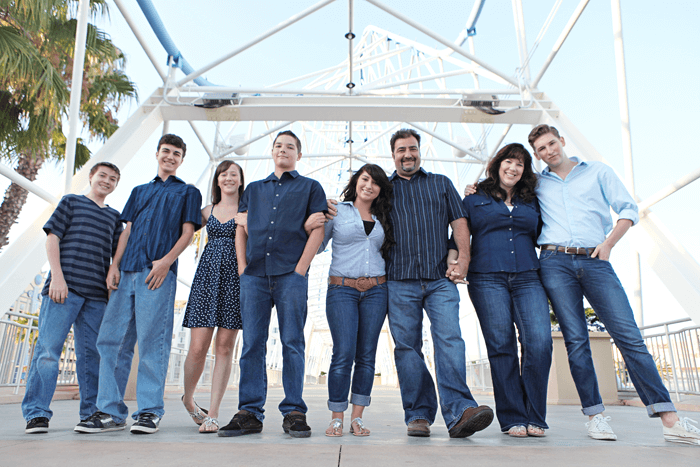 GSI: GSI is located in Orange County, California and serves surrounded counties. Thus, allowing GSI to have a hands-on role in collecting donations, preparing, raising awareness and giving the filled purses to the recipients. Hence, the old adage ‘giving is better than receiving” really holds true when you live it! When you actually look into the eyes of these women that have turned themselves around it motivates you to give back even more. Donations are accepted year around. What is the company's goal in taking initiative to support the community? GSI: Simply stated, expressing gratitude through action for GSI’s success. The entrepreneurial spirit is a mindset and at the core of George Sano. It is an attitude and approach to thinking that actively seeks out change, rather than waiting to adapt to change. It is a mindset that GSI fully embraces - critical questioning, innovation, service and continuous improvement. Why should investigators take time to give back to the community? GSI: Where would we be without our communities? Disconnected to say the very least. To borrow a line from Jerry McGuire, “We live in a cynical world.“ By giving back, a company can turn that notion around and truly make a positive impact in the world. Why do you think the holidays are such a popular time to make donations? GSI: It is the season for giving so it is that much easier to ask others to participate and most often, they do so wholeheartedly. It has been GSI’s experience that once the giving spirit is ignited enthusiasm spreads like wild fire. How can investigators who also want to donate help? 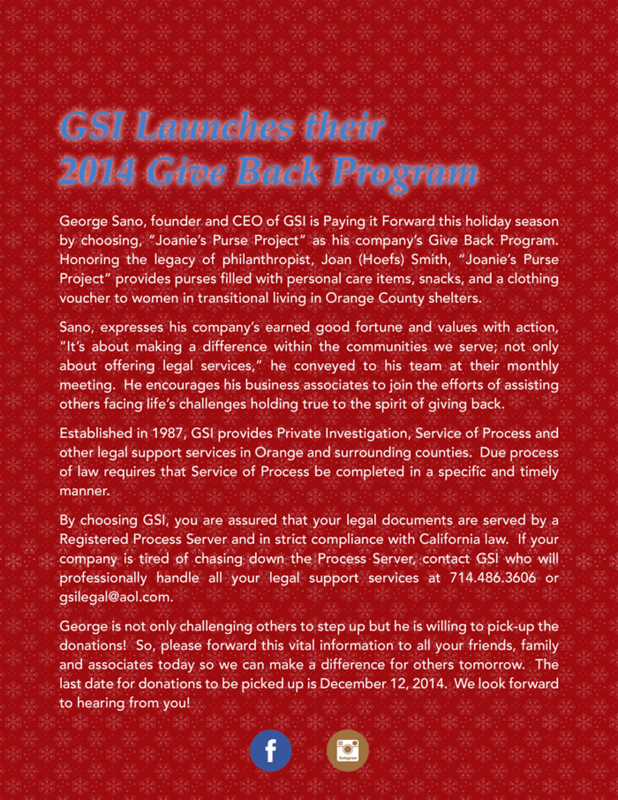 GSI: PI and Process Service agencies alike can contact us at: [email protected] or call 714.486.3606 to make arrangements for donations to be picked up in Southern, California anytime (although, December 12, 2014 is deadline for this Christmas) since we collect year around for giving purses on Mother’s Day, too! If you want to participate but do not live locally contact the outreach program through Joanie’s Purse Project on Facebook or George Sano Investigations on Facebook. Giving back to your community is an honorable gesture any time of year, and it's also a great way to highlight your company in a positive way. If your firm has taken the time to give back to your community, send us an email at [email protected] to share your story.